When the book was revised, the only change made to this recipe was that the flour is not sifted, so sift or not, as you prefer. This is a lovely dessert - delicious and beautiful. Remember to use unblanched almonds since they give the crust its rich color. First, grind the almonds while the food processor bowl is dry then put them in a small bowl. Add the all-purpose flour to the bowl of the food processor, and mix the butter into the flour. Add the ground almonds back to the food processor bowl, and process until just mixed in. In a separate bowl mix the sugar with the cloves, cinnamon, and beaten egg yolks. Add to the flour mixture in the food processor, and mix the dough until smooth and well blended. Put two-thirds of the dough into a nine-inch ungreased springform cake pan. Using your fingers, press the dough over the bottom of the pan and half way up the sides. Spread with jam. Now for the lattice, which needs to go across the 9-inch pan. What I do is pinch pieces of dough into rolls ⅓-inch wide and as long as I can make them without their breaking apart directly onto a cookie sheet, and then put the sheet into the refrigerator to chill. This only takes a few minutes. These strips should be as thin as possible because the dough is so short (meaning loaded with butter), it spreads when it bakes. 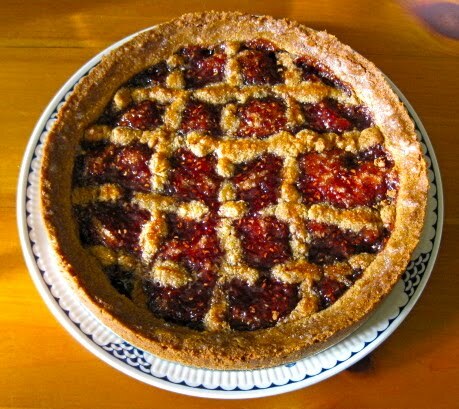 To create a lattice across the top of the torte, I lift the chilled rolls off the cookie sheet with a spatula and slide them off the spatula one-by-one across the torte with my fingers, going in one direction. The pieces probably won't be long enough to reach all the way across, and you will have to join other pieces to them, but as long as the pieces barely touch one another, when the torte cooks, the rolls will spread, and the pieces will meet, and the lattice will be okay. The chilled rolls warm and soften quickly so sometimes I have to re-chill them for a few minutes to keep going. Once you have the strips across in one direction, when you do the other direction, only put little pieces where they need to go. In other words, do not put dough on top of dough because it will be too thick. Again, just have the pieces touch. The strips only have to barely touch the dough around the rim of the pan. I usually do four strips in one direction (the first strips) and then three in the other because I don't want to cover too much of the raspberry jam. I know these instructions sound ambiguous, but after you do it once, you will see what I mean, and the result will be beautiful. Brush the lattice strips with the beaten egg white. Bake on the lower shelf of the oven until the lattice strips are golden brown, about one hour and fifteen minutes. But keep checking because the almond-loaded dough can burn. I have had it be ready within 50 minutes. Set the pan on a rack and partly cool the torte before removing the rim of the pan. Let it cool completely to serve. I usually top it with softly whipped cream to which I have added a little Luxardo Amaretto. It's also good with vanilla ice cream.